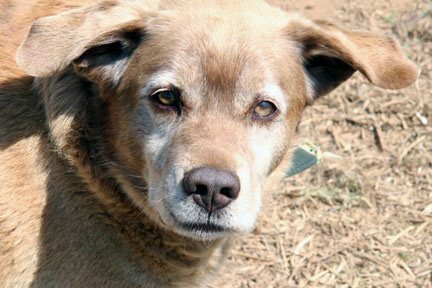 I hesitate to say that senior dogs are necessarily more mature or have fully developed personalities, but having "been there, done that, know where all the bones are buried", older dogs come with a pre-established set of personality traits that they've developed over the course of their lives. Whereas a puppy may, in general, be more impressionable, a senior dog may have established behaviors for a variety of scenarios. If you're the original owner of a dog, you probably already know what they're going for a given situation. 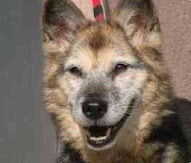 If you're a newly adopted parent of a senior dog, a situation new to you (ie, meeting other dogs, reacting to loud noises, knowing basic commands) may very well be old hat to your pal. Start with common commands - Sit, down, stay, come. I've always been pleasantly surprised at how many my old adoptees have known without being taught or be encouraged with a treat of some sort. Walking on a leash - Your first introduction to your potential adoptee may have been to give them a short walk down the street to see how they react to you. I find that a lot of older dogs know how to walk well on a leash, however right out of the gate they may be testing you or not accustomed to walking with you in particular and will either pull or move along at their own pace. Trying the "heel" command may or may not work here. The best advice that I can offer here is that if you're consistent, you'll figure this out this together and find your way through this item. You want to work on "heel" as a slightly longer term strategy. Staying home alone - Many senior dogs owners that I've talked to have no problem leaving their pooch at home. I very much could say the same thing, but recently had to re-train my buddy to not be so sensitive about me heading out for the day. Sometimes your old pooch is going to come with separation anxiety based upon some past event and other times (like in my case) it may develop after the initial bonding period. Meeting other dogs - Unless you're completely isolated, you're going to meet other dogs at some point, so best to work it in with your regular walking routine. Be careful and stay alert. You don't want either your dog or another injured because you weren't paying attention to warning signs from either animal (growls, hair standing up on their back, showing teeth, etc.). The only thing I have to add here is that socialization training is not something that only happens in a class setting, it happens everyday because you're continuing to invest time with getting your pal acquainted (or reacquainted) with dog-on-dog interactions. Work at playing - I've been surprised many times with the pre-learned my senior pooches have arrived with, including: displaying herding behavior with ducks, unfolding blankets, and opening doors as part of their search for treats. Take the time to play with your pooch to learn some of the tricks they have picked up along the way. What's the craziest thing that you've caught your old dog doing that you're not sure where they picked it up? Either comment or pass them along and I'll include them in a future post. Point #3, only goes to show you that YMMV (Your Mileage May Vary) with any of these items. The good news is that just because your older pup knows or doesn't know something, it doesn't mean that they'll never learn anything new. It's important to work with your senior dog to keep their mind active not only for their own health and well-being, but also to help build and maintain that bond between the two of you that makes all of this worth it.